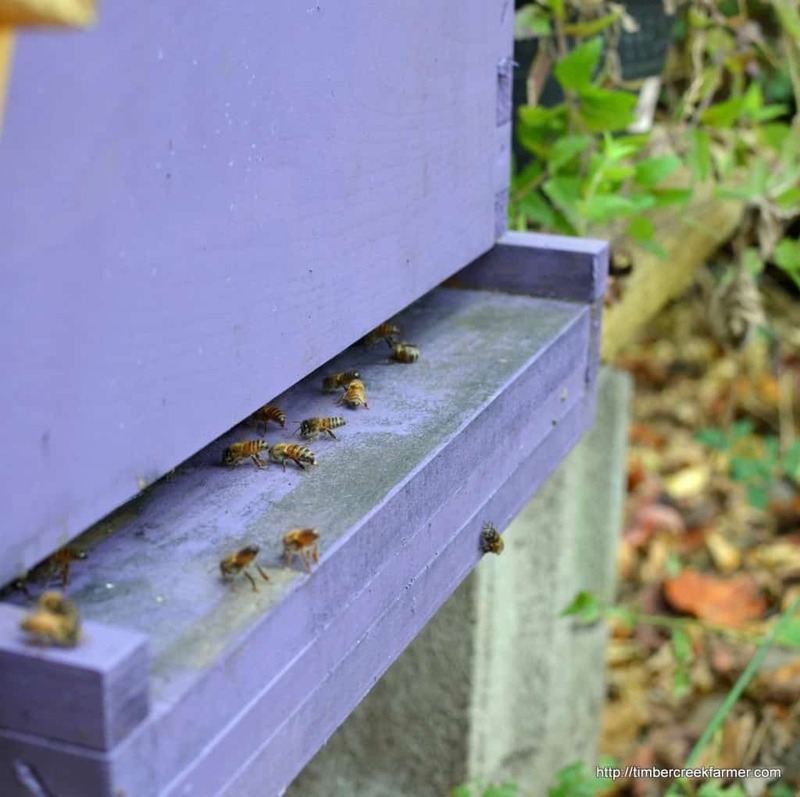 Caring for honeybees is a learning journey. We have been beekeepers for only eight months. My neighbor and I started a hive together this past spring. We have learned a lot along the way and still feel like we still know very little about the care of honeybees. 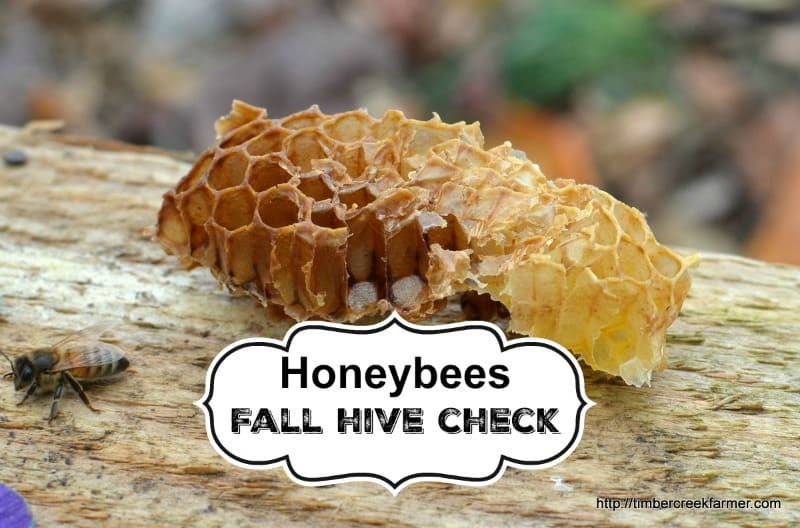 But, the hive is still alive, hopefully thriving, and so it was time to carry out the honeybees late fall check. 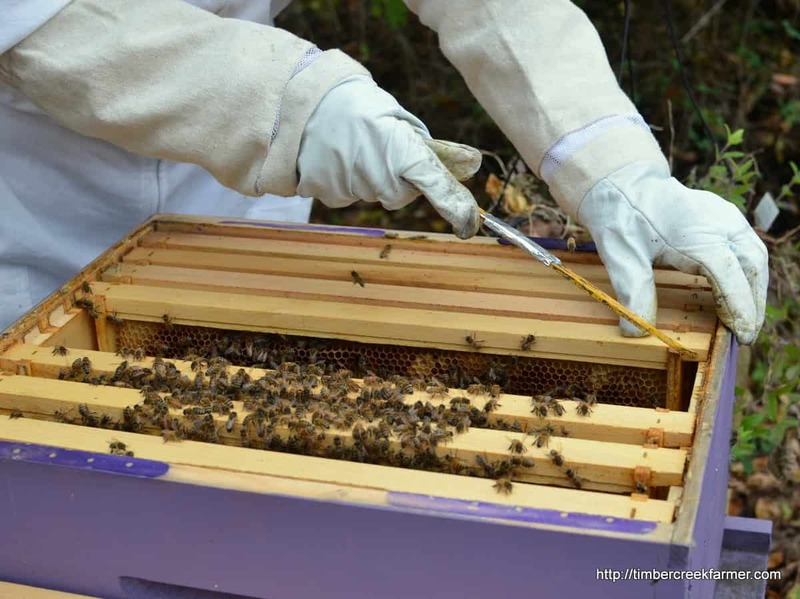 First, let me share a bit of our first year in honeybee keeping. 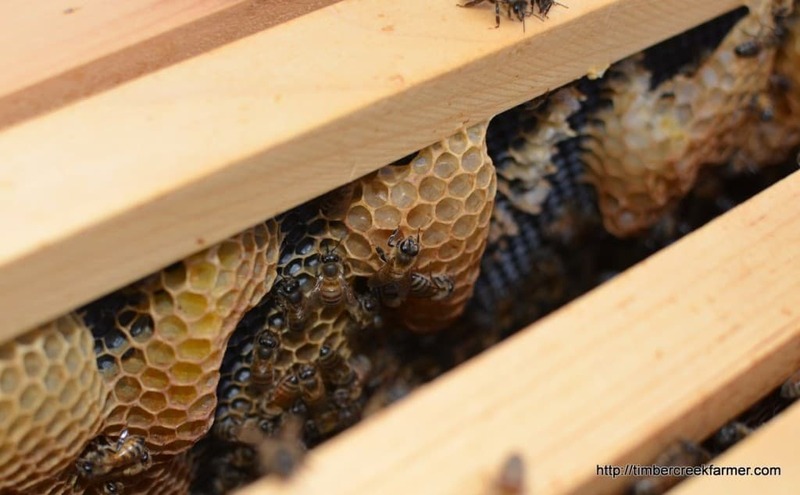 In April we picked up a nuc to fill our hive. The new colony did very well this summer. At one point we added a second super and ten more frames. The honeybees looked great each time we visited the inside of the hive. Comb was being formed and lots of cells were already capped by early August. Everything seemed to be going according to plan. 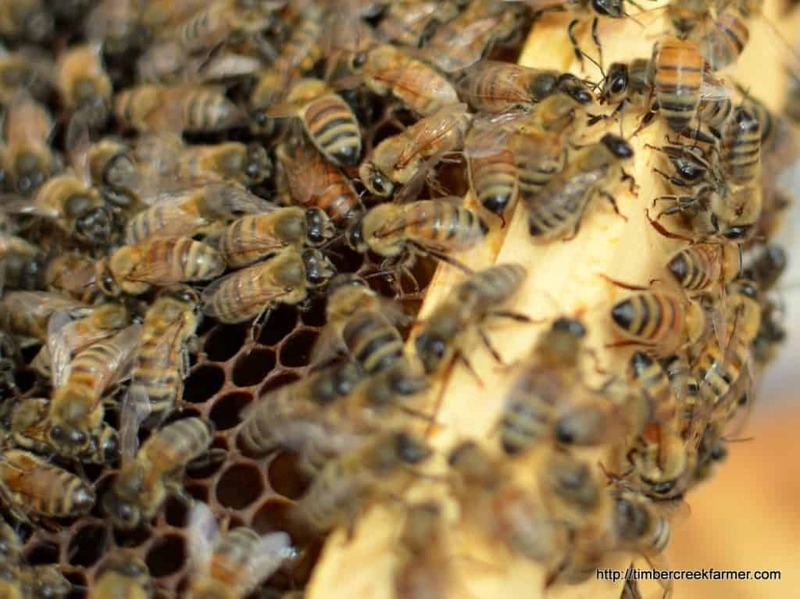 Bearding – Honeybee behavior in the heat. At one particularly hot spell this summer, the honeybees were seen hanging in large clusters on the outside of the hive. After checking with the local beekeepers, we learned that the bees were most likely overheating and trying to cool off. A long time beekeeper asked how much ventilation we had for the hive. What? They needed ventilation? I guess we missed that chapter. He patiently explained to me how he added small twigs or sticks between the layers of the super boxes to allow more air flow. Also,he explained how our weatherproof cover was not positioned correctly. It needed to have some ventilation also, and should have a slight tilt to it. After making the adjustments we had no further bearding of honeybees on the hive. Our fall weather can be very warm and then suddenly plunge into the 40’s overnight. This fall has been no different. We had fall, then a touch of cold, then a very long stretch in November of unseasonably warm days with most high’s in the sixty degree range. The honeybees continued their normal activity. We hesitated taking out the extra ventilation because of the warm days. As the summer growth begins to get ready for fall, the honeybees might be looking for new sources of food. It would be good to begin offering them sugar water. This is actually a very thick syrup! I was surprised at how much sugar it took to make the syrup. The syrup was given to the bees despite the fact that the temperature continued to be warm. Nothing much was flowering at this time of year, although a few plants here and there tried to make a comeback. So the honeybees enjoyed room service in a feeder contraption. Finally, the weather report was again calling for cold temperatures and seasonal weather. So we decided we better do one last check on the bees and take out the ventilation, make sure everyone looked healthy, etc. On went the bee suits. The smudge pot was lit and we headed over to the hive. The honeybees seemed to be acting normally. A few came out to see what we wanted., granted access and flew away. More bees exited as they smelled the smoke. Carefully, I removed the cover and the inner cover. And then we noticed that something was wrong. The top super with then frames was now empty of honey. Earlier in the summer, after the original super was filled with honey, we added the second super. The full frames were put into that super and the lower super received new frames. The honeybees continued to work and build comb and honey and the next time we checked, both supers had a good bit of honey. At that point, we made a decision to wait to take any honey, until spring. With it being a new hive, we didn’t really know how much they would need to sustain the colony over the winter. Better safe than sorry was our reasoning. Where did the Honey go? Now there was no honey and much of the comb was dry and brittle. The bees seemed very healthy though. None of this was making sense and being new to the beekeeping, we had no idea what to think. But, winter days were fast approaching and the bees would be hungry! Again, we consulted friends in the community who have much more experience than we do in beekeeping. They kindly came to take a look, and also they had a hive do the same thing recently. One thing we needed to look for was the presence of a Queen Bee. We needed to look for evidence of disease, and damage from other insects. Luckily, the queen was found. What I learned is that without a queen, the workers don’t work very hard. 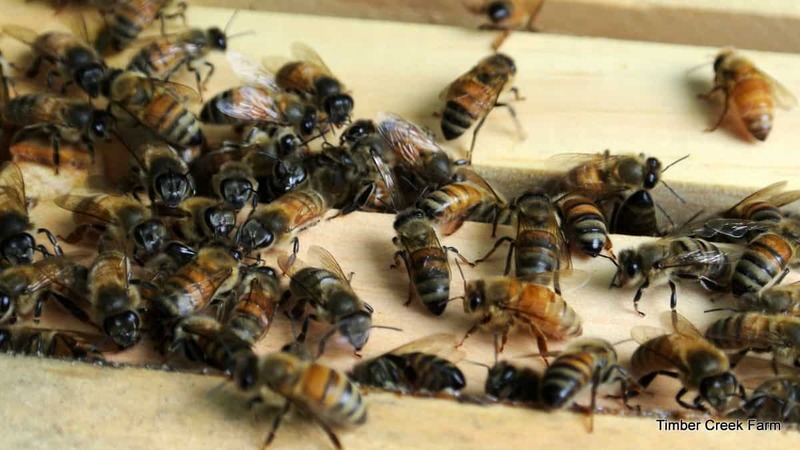 They won’t be as protective of the hive and could let robber bees enter without a fight. Also without a queen, the colony will quickly go to ruin, since the workers have nothing to work for. Apparently this queen bee is a big deal! do you see the Queen? She looks different than the other honeybees. So since we do have a queen, feeding the bees is a viable option. We are going to put fondant in the hive under the weatherproof cover, which should give the inhabitants plenty of energy to survive the winter. Here is one recipe for bee fondant. This one, that a friend described to me, seems a lot simpler to me. Melt one bag of marshmallows in the microwave. Add in 1/2 cup of a liquid sweetener (a 2:1 sugar syrup will work), or water. Do not use honey as the liquid as it could contain spores of toxins from a sick hive. Add a few cups of powdered sugar and mix until a soft dough forms. Continue adding powdered sugar, possibly even up to two pounds of the sugar, mix by hand when necessary until a stiff pie crust consistency forms. When the dough is stiff and formed, roll it out with a rolling pin and cut into strips or one large square that will fit under the weather proof cover. 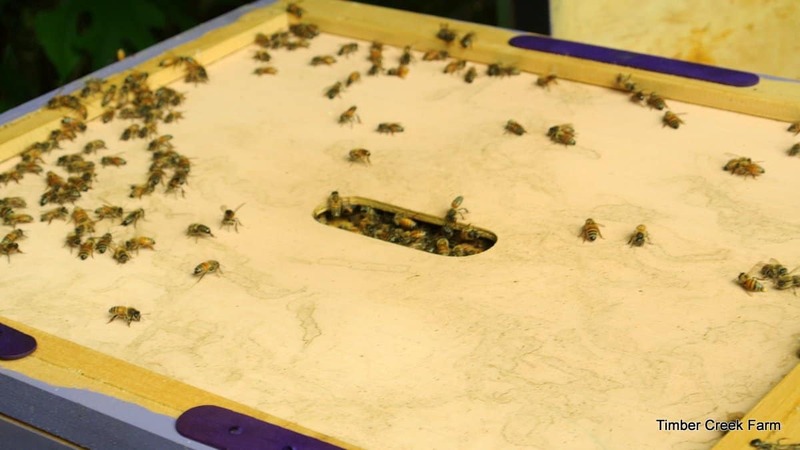 A feeder cover is recommended, as in this article on feeding fondant to bees. If you are concerned about using marshmallows made with GMO corn syrup, here is a recipe for homemade marshmallows, and this one for corn syrup free marshmallow fluff. I have talked to a few people about how they feed the fondant. Some use a screened inner cover to hold the fondant but allow the bees to feed through the wire. Some people have told me they just lay the fondant on top of the inner cover, or even cut the fondant into one inch strips and lay it on top of each frame inside the hive. I think I will try the marshmallow fondant first and see how it works. It seems to use less sugar than the first recipe I posted above. 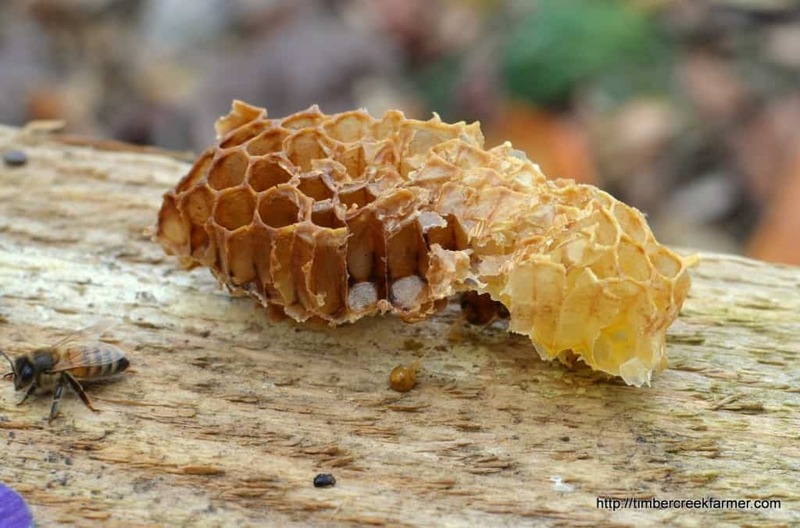 What could have happened to our Honeybee Hive? Two theories have emerged as likely possibilities. One theory is that there are robber bees attacking the hive. Hopefully cold weather will control and correct this situation. Another part of this same theory has to do with our crazy warm fall weather. The warmth could fool the bees into thinking it was spring. They went out to forage for the new baby queen, found nothing much, came back famished! Then feeling quite hungry from the foraging, they ate the honey stored for winter. Since the comb was not destroyed or torn up and we had no dead bees, it makes the weather theory even more probably. According to a beekeeping friend, the robber bees will make quite a destructive mess of the comb. We did not see evidence of that. What ever the real reason, the bees have no honey and we will have to feed them through the winter. The fondant should last a good long time between feedings but since we are new to this, it will be important to keep a close eye on the hive and keep food available at all times until spring arrives. I only read a paragraph as it was still loading, but I would NEVER feed marshmallows to bees!!! (unless they are homemade, or organic and contain only the basic ingredients which are organic. )Marshmallows contain toxic ingredients, HFCS, most likely GMO sugar, etc!!! (the campfire brand marshmallows contain: corn syrup (HFCS), sugar, (unless stated this is from beets, GMO),modified food starch:(corn;GMO, gelatin, water;(fluoride, toxic metals),dextrose; “Dextrose is made when starchy plants — primarily corn(GMO) (and less commonly wheat or rice) — are broken down into monosaccharides using enzymes, and to a lesser extent acids. Because it’s from natural sources, dextrose is considered “natural,” but it is still processed”. natural and artificial flavor (artificial could be just about anything), tetrasodium pyrophosphate (???WHAT???). CAUTION! CAUSES EYE IRRITATION. MAY CAUSE SKIN AND RESPIRATORY TRACT IRRITATION. Severe irritant. May cause redness, burns. Low acute dermal toxicity. May cause irritation. Low acute inhalation toxicity. Dusts may cause upper respiratory tract irritation. Harmful if ingested. May cause burns to mouth and esophagus, nausea, vomiting, diarrhea. This is probably ONE reason the bees are dying! If YOU wouldn?t eat it, don?t feed it to livestock!!!!! Use a good source natural sugar, like organic cane, or some other form of NATURAL and ORGANIC to them. Powdered sugar contains cornstarch, and unless you have organic, the corn is from GMO crops! Again, not good for bees! Thanks for letting me vent. Bees are one of the most important livestock and vital to our own survival. They NEED and SHOULD GET the very best we have to offer them!